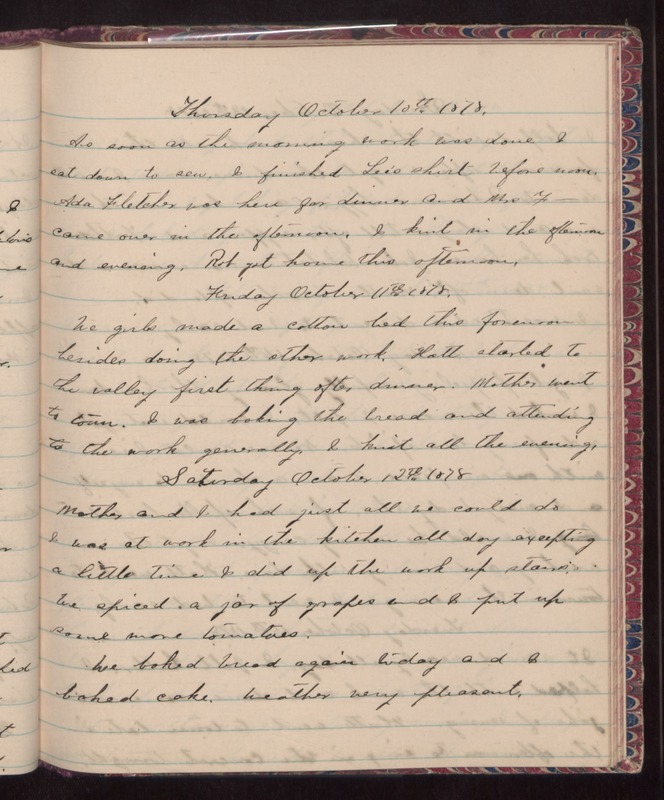 Thursday October 10th 1878 As soon as the morning work was done I sat down to dew. I finished Lee's shirt before noon. Ada Fletcher was here for dinner and Mrs. F-- came over in the afternoon. I knit in the afternoon and evening. Rob got home this afternoon. Friday October 11th 1878 We girls made a cotton bed this forenoon besides doing the other work. Hatt started to the valley first thing after dinner. Mother went to town. I was baking the bread and attending to the work generally. I knit all the evening. Saturday October 12th 1878 Mother and I had just all we could do. I was at work in the kitchen all day excepting a little time I did up the work up stairs. We spiced a jar of grapes and I put up some more tomatoes. We baked bread again today and I baked cake. Weather very pleasant.